You've found the “U.S. Mulefoot Pig Breeders” page here at Hobby Farm Wisdom! If this is the first time you have visited our site: Welcome! Mulefoot is a breed of domestic breed that was brought to the Gulf Coast by the Spanish, although its original origin is unknown. The name is derived from their intact, uncloven hooves similar to that of a mule. 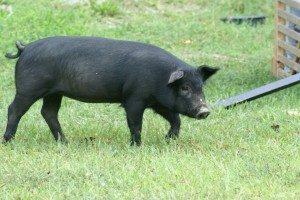 Mulefoot pigs are typically solid black although some have occasional white markings. Their ideal environment is on pasture since they have excellent foraging ability. Mulefoot pigs have a reputation of being very good mothers, often having litters with an average of 5 – 6 piglets. Despite rumors, this breed is not immune to hog cholera but is considered exceptionally hardy. As of 2013, this breed is considered critically endangered.